The issue is affecting some users of Apple Music, the Apple TV, and the Mac and iOS App Stores, plus a number of iCloud services including Notes, backup, web apps, and iCloud Drive, according to Apple's system status page. People may also be seeing trouble with iTunes, iBooks, and/or cloud-based Photos functions. Problems began shortly before 1 p.m. Eastern time and are still ongoing. While Apple hasn't acknowledged the source of the glitches, Amazon's S3 (Simple Storage Service) is currently experiencing "availibility issues" on the U.S. east coast, leading to problems for dependent companies. Apple is known to rely on Amazon for portions of its cloud infrastructure, despite investing in large-scale data centers in places like North Carolina. The company is thought to be gradually shifting away from its dependence on Amazon. It will, for instance, be turning its Mesa facility into a "global command center," and is working to establish its first European data centers in Ireland and Denmark. The Irish project has yet to begin construction, owing to delays caused by local concerns like environmental impact. Recently it was revealed that Apple is planning to expand its Reno data center by over 375,000 square feet, at a cost of about $50.7 million. The facility currently handles tasks like Siri, FaceTime, and iMessage. 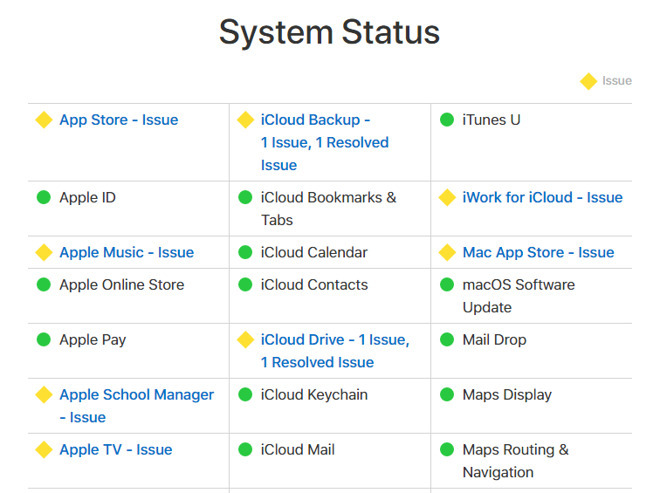 Update: Apple's system status page is showing an all clear as of 1:35 p.m. Pacific.